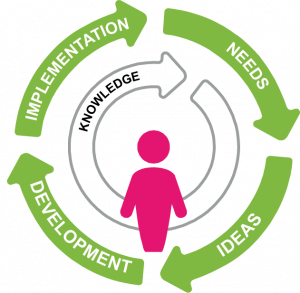 The design process can be applied to all change development, from an organisation’s activities to the appearance and function of a product. Whether you are an individual innovator, an established company or a public actor, product development or change development is based on needs, usually human needs. There may be a need to solve a new problem or to improve something that already exists. Developing new goods or services requires you to familiarise yourself with the intended user or the established customer’s way of thinking and reasoning. You must understand your user. During the first phase of the design process, you carry out user studies and use the methods and templates that belong to this phase. Once you have collected the results of the user studies, it is time to process the information and define what you want to develop, the issues you want to solve and for whom. 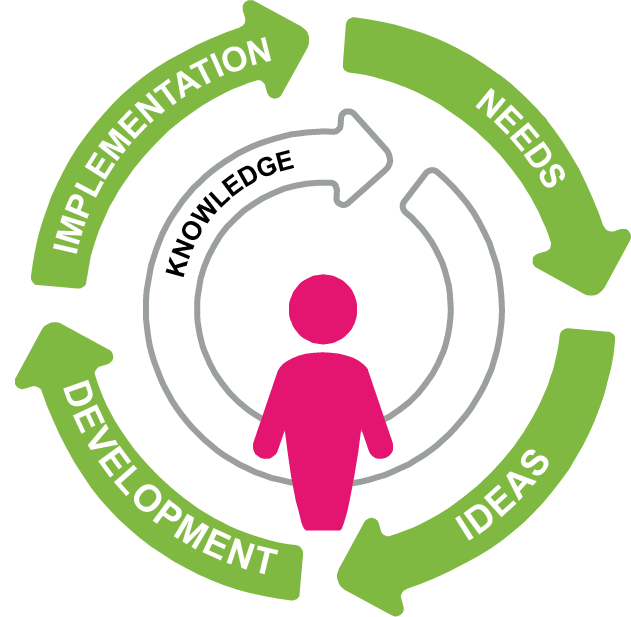 Gather the information and knowledge you received in a way relevant for the problem area you are investigating. Compile your knowledge, it will be used in the next phase. The requirements or needs the user expresses can be collected in a list of demands. Do not think of solutions yet. Fixating on the solution too early limits your possibilities and may even cause you to develop a poor solution to the problem. The solutions should be generated only now in the idea phase. Unleash your creative ability. Make sure to come up with as many different solutions as possible to the problem. There are numerous creative methods and templates to generate ideas. Now you can start sifting the ideas you have developed. Which ideas solve the user’s problem in the best way? What ideas do you have the ability to produce? What fits your business idea? The requirement list can help you choose the ideas. At this stage it is time to take into account all the requirements that can be imposed on a product. Market requirements, legal requirements, production requirements, environmental requirements, etc. The list may be long. Your job as a designer is to bring together all the requirements into a user-friendly and attractive product or service. You may choose some ideas to move on to the next step in the design process. It is now that you are going to provide a basis for testing your ideas. This is done through visualisation and prototyping. Creating prototypes for physical goods is somewhat different from creating prototypes for services. The goal of making a prototype is to test the idea on the user. Services must be prototyped through different visualisation methods or role play. There are several different tools and methods available. Prototypes of goods are developed differently. You may begin with a function model, that is, something you can use, and then proceed to visualise different looks through sketches or appearance models. With each model, you get closer to the target, the finished product. An important step in the design process is testing. In order to understand if you and your team managed to come up with a successful idea, it must be tested on the intended user or customer. The test will answer if you should restart the process or if you are on the right track. If you want to protect your idea before this stage, you can decide what kind of protection you need for your product or service. If the test went well and your users are satisfied, then it’s time to implement your idea. This phase often involves high costs in investment and this is where the design process shows its great benefit. If you followed the method and used the tools, you can be sure that the product or service you developed is worth putting into production. Launching a product on a market is the ultimate test of its potential. It is only here that the price in relation to performance is tested. It is the real-life feedback to your work. Time for a second generation of your product? Even if you have launched a good product, there is always room for improvement. As time passes, the world and customer behavior change. Then it’s time to start over again. Go back to Understand at the top. Good luck with your product development and change development!